The varied programme of this recording identifies, as Armonico Consort’s director, Christopher Monks describes, ‘ … a wide range of pieces united by the tendency of their composers to wear their hearts on their sleeves and their ability to fix a sense of raw emotion on paper’. For the majority of the composers represented here, the reasons for revealing naked sentiments through their music is as a response to a religious theme, whether through the suppression of particular relgious practices or the influence of relgious ideals themselves. Crossing several centuries, from the sixteenth to the present day this album displays how every generation has been inspired to use both sacred and secular music as a powerful medium to express their personal emotions. 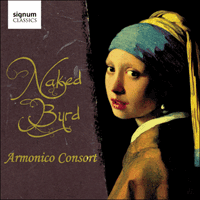 The varied programme of this recording identifies, as Armonico Consort’s director, Christopher Monks, describes, ‘…a wide range of pieces united by the tendency of their composers to wear their hearts on their sleeves and their ability to fix a sense of raw emotion on paper’. For the majority of the composers represented here, the reasons for revealing naked sentiments through their music is as a response to a religious theme, whether through the suppression of particular religious practices or the influence of religious ideals themselves. Crossing several centuries, from the sixteenth to the present day, this disc displays how every generation has been inspired to use both sacred and secular music as a powerful medium to express their personal emotions. When Henry VIII severed traditional ties between Christianity in England and the Roman Catholic Church, he prompted a series of events which considerably changed the lives of composers in England and the way in which they worked. The inevitable consequences of the adoption of Protestantism above the Catholic tradition would lead to the abandonment of Latin as the language of the church and, with this, a vast body of music by Renaissance composers fell into disuse. By the time of the staunchly Protestant reign of Henry’s only son, Edward VI, the use of Catholic music, and particularly those works that referred to the Blessed Virgin Mary and Catholic saints, were outlawed altogether. This caused a number of composers to be become recusant, and to continue practicing the composition of Catholic works with Latin texts in a degree of secrecy. With the early death of Edward VI, the reign of Queen Mary saw the ties with the Catholic Church restored and composers writing Catholic music once more, before Queen Elizabeth I returned the church to Protestantism, although with a degree of tolerance for Catholicism at the discretion of the queen. As a personal favourite of Queen Elizabeth, William Byrd (c1540-1623) was, to an extent, allowed to continue being a practicing Roman Catholic in an England where Protestantism was obligatory. To behave in this manner was highly provocative and even dangerous, but the queen so favoured Byrd that she eventually granted him and his older colleague at the Chapel Royal, Thomas Tallis (1505-1585), a joint monopoly on the printing of music in England. The principle result of this royal patent was the Cantiones Sacrae of 1575, consisting of seventeen Latin motets from each composer, one for each year of the queen’s reign. However, the motet Ave verum corpus was from the first of two later cycles by Byrd entitled Gradualia (1605) that mainly contained music appropriate to the major feasts of the church’s year. The text is a short hymn for the Eucharist for the feast of Corpus Christi that dates from the fourteenth century, and is attributed to Pope Innocent VI. Thomas Tallis became a Gentleman of the Chapel Royal during the reign of Henry VIII and served under all the subsequent Tudor monarchs up until his death in 1585. As with Byrd, Tallis composed a substantial amount of music for the Catholic Church as well as various works in the vernacular for the protestant Church of England, according to the religious loyalties of the particular monarch of the time. Loquebantur variis linguis is a choral respond for Pentecost, which employs a plainsong cantus firmus, featured in the tenor throughout the work and surrounded by six parts of rich polyphony. The third and final composer in this programme from the reign of the House of Tudor, John Sheppard (1515-1558), was, like Tallis, appointed a Gentleman of the Chapel Royal during the reign of Henry VIII, having previously been Informator Choristarum at Magdalen College, Oxford. Without the proliferation of printing that came in later periods, and the constantly changing allegiances between Catholicism and Protestantism, it has proved difficult to date much of Sheppard’s music, and many of his Catholic works could have been from the reign of Henry or Mary, with no great variation in style between the two periods. It is suspected that this setting of the text was written while Sheppard was at Oxford, as it was employed twice each day at Magdalen College, despite its proper use being as an antiphon at Matins on Trinity Sunday. Similar to Tallis’s Loquebantur, Sheppard’s Libera nos, salva nos contains a cantus firmus of the plainsong in the lowest voice part, beneath tranquil and measured polyphony. Renowned today for only a single work, Gregorio Allegri (1582-1652) was a composer and priest, who spent much of his life in Rome, and as a member of the papal choir of Pope Urban VIII from 1629 until his death. The penitential text of Miserere mei is that of Psalm 51, which was traditionally used during Holy Week, and the motet was written for, and sung exclusively by, the papal choir each year. It is fabled that the punishment for copying the manuscript of this work was excommunication from the Catholic Church, although by the end of the eighteenth century a number of editions of the work had appeared. The work is simply structured, and is written for two choirs, one each for four and five voices, with each odd verse of the text taken alternately by these choirs. The even verses of the text are chanted by lower voices, apart from the final verse, which is sung by the combined choirs. The name of Robert Pearsall (1795-1856) is synonymous with a group of devotees of Renaissance music and its revival in the first half of the nineteenth century. Born in Bristol, Pearsall initially became a barrister, but spent most of his life in Germany and Switzerland, following a slight stroke. Pearsall is mostly known for his madrigals, which he began to compose following a brief return to his home country in 1837 and which are clearly influenced by those of the late Tudor period. Lay a garland is a setting of a secular text from The Maid’s Tragedy by the Renaissance playwright Francis Beaumont and is in eight parts. In the play, the text is sung by one of the characters, Aspasia, when she realises that her betrothed has been forced into a marriage with the mistress of the king. Pearsall here develops the use of the suspension to exquisite lengths, in this perfectly formed and mournful work, developing the secular practices of such composers such as Thomas Morley, and in particular his balletts. Born some thirty years after Pearsall, the Romantic Austrian composer Anton Bruckner (1824-1896), was mostly renowned for his large-scale symphonic works, although he also wrote a considerable number of choral works including a series of compelling motets, each providing a powerful response to the text and the image of a towering musical construction within a miniature form. Ave Maria is characterised by its full, rich textures, with the upper and lower voices of the choir heard separately before being combined for the poignant second half of this text in praise of the Blessed Virgin Mary. Morten Lauridsen (b1943), the first of four contemporary composers in this programme, has been Professor of Composition at the Thornton School of Music at the University of Southern California for over thirty years. He has been described as ‘…the only American composer in history who can be called a mystic, [whose] probing, serene work contains an elusive and indefinable ingredient which leaves the impression that all the questions have been answered’. O magnum mysterium was premiered in 1994 by the Los Angeles Master Chorale—for whom Lauridsen was composer-in-residence from 1994 to 2001—and has since become one of his most performed works. The text is from the liturgy of matins for Christmas Day and focuses on the birth of Christ as a wondrous and yet mysterious event, in that the Son of God was born in such humble circumstances, unbeknownst to the world at large. Lauridsen himself states that ‘For centuries, composers have been inspired by the beautiful O magnum mysterium text depicting the birth of the newborn King amongst the lowly animals and shepherds. This affirmation of God’s grace to the meek and the adoration of the Blessed Virgin are celebrated in my setting through a quiet song of profound inner joy’. Composed a little earlier in 1987 for a pilgrimage by Pope John Paul II to his native Poland, Totus tuus by Henryk Górecki (b1933) was first performed on 14 June in the same year by the Choir of the Warsaw Academy of Catholic Theology at a High Mass celebrated by the Pope. The text is Marian and was extracted from a poem by the contemporary Polish writer Maria Boguslawska. Not one to court publicity, Górecki came to international attention during the 1970s when his most renowned work, Symphony No 3, received its first recording. The simple homophonic nature of Totus tuus lends a luminous quality to the chant-like minimalism with much repetition leading to an intense statement of faith. From 1977, when he became a member of the Russian Orthodox Church, John Tavener’s (1944-2013) musical output has been dominated by religious texts and music, and largely influenced by the music of the Orthodox Church. Tavener first came to prominence with such works as The Whale and The Protecting Veil, the latter of which was a commission for the BBC Proms in 1989. Written for unaccompanied choir, Song for Athene is perhaps his best known work; written in 1993 it was notably performed at the funeral of Diana, Princess of Wales in Westminster Abbey four years later, watched by a huge global audience. The most recent work on this disc, Hope finds a way by Jonathan Roberts (b1983) is an example of the charitable activities of the Armonico Consort in supporting music education, and was written by younger members of the group. First performed in one of the Consort’s Christmas concerts. Christopher Monks states that ‘Jonathan Roberts has been an assistant for our workshops for some time and we’ve been training him up for two or three years now. He thrust this piece in front of us and I think it’s very, very beautiful’. The text is by Vaughan Roberts, and the work is scored for harp and upper voices.